Last year I wrote a post for the MITH blog describing how to build a digital curation workstation using readily available hardware (at least for the present) and the BitCurator suite of digital forensics tools. Matt Kirschenbaum and I revisited that topic a few weeks ago for a poster we presented at the Digital Humanities 2013 conference. We got a number of requests asking for the digital version of the poster, so I’ve revised it slightly and uploaded the poser in blog form below. The most significant update from my orginal post in 2012 is the case study involving the transcription work done by Niel Fraistat on Percy Shelley’s Prometheus Unbound manuscripts–completed in 1989 and saved on 5.25″ floppy disks. Otherwise much of the information remains the same, though there is significantly more detail regarding the BitCurator suite of tools. As always, feel free to leave questions or comments in the Comments section below. This post builds on the recent report from the Online Computer Library Center (OCLC) titled “You’ve Got to Walk Before You Can Run: First Steps for Managing Born-Digital Content Received on Physical Media” (Erway, 2012). The OCLC report identifies eleven specific steps archivist can follow to safely and effectively process born-digital content. 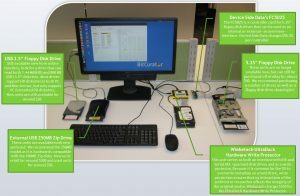 This post considers the hardware needs of archivists and scholars as they look to implement the OCLC’s recommendations by offering a model born-digital curation workstation using readily available PC hardware and a suite of free and open source tools being developed and extended by the BitCurator project. We also demonstrate why such a workstation would be a valuable asset for a working digital humanities center through a case study involving the Shelley-Godwin Archive. BitCurator is a research and open source software development project designed to bring digital forensics tools and techniques to collecting institutions. The BitCurator Environment is a Linux based suite of digital forensics tools that facilitate the creation of forensic disk images, file analysis, meta data extraction, and the identification of personally identifiable information (PII). BitCurator can be installed as either a stand-alone Linux operating system or as a virtual machine within a Windows or OS X host. While there exist custom hardware solutions for preserving digital content, these options can be cost prohibitive, especially for a smaller DH center. For example, the Forensic Recovery of Evidence Device, or FRED, from Digital Intelligence can cost several thousand dollars. By contrast, the workstation we demonstrate here is designed to cost just over a thousand dollars, including the media access devices described in the next section. The workstation will begin with a standard Windows or OS X based PC. While the exact technical specifications can vary, we offer the following recommendations as the minimum specifications for a digital curation workstation. More powerful hardware will, of course, result in less processing time, but a computer system with the specifications below should be available for roughly $500 from any number of retailers. A multi-core CPU such as the Intel i5 series or AMD Fusion line of CPUs. The digital forensics tools in the BitCurator environment are mulit-threaded, so they will take advantage of multiple CPU cores and thus speed up processing times. Older multi-core CPUs such as the Intel Core2 series can also function well with BitCurator. If running BitCurator as a virtual machine, make sure your CPU has support for hardware virtualization: VT-x on Intel CPUs, and AMD-V on AMD. Four to Eight Gigabytes of RAM. We recommend at least 4 gigabytes of RAM. BitCurator can run with less, but performance will suffer. 8 gigabytes of RAM is recommended if you plan to run BitCurator as a virtual machine within a host operating system. Hard drive storage based on need. You will need at least 20 gigabytes of storage space to install BitCurator, beyond that you will want to plan for storage needs based on the media you will be accessioning. Memory card reader and Blu-ray player. Choose a memory card reader with support for as many types of memory cards as possible. The Blu-ray player should be backwards compatible with burned DVDs and CD-ROMs. Still available new from online retailers, look for a drive that can read both 1.44 MB(HD) and 800 KB (DD) 3.5” diskettes. 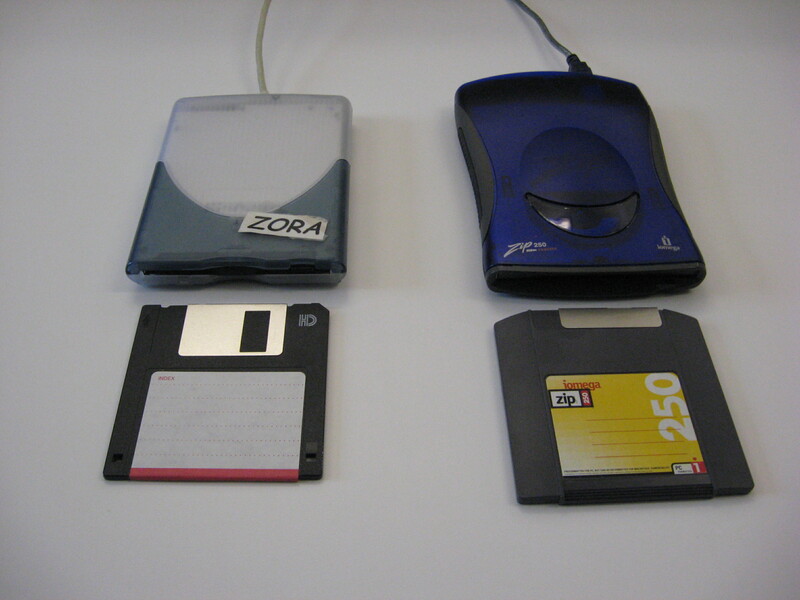 Most drives support HD diskettes in both PC and Mac format, but only support PC formatted DD diskettes. Units are still available for around $20. These units are available both new and used. We recommend the 250MB model as it is backwards compatible with the 100MB Zip disks. New units retail for around $200 and used units for around $50. The FC5025 is a controller card for 5.25” floppy disk drives that can be used as an internal or external—as seen here—interface. Device Side Data charges $55.25 per controller. These units are no longer available new, but can still be purchased off of eBay for about $50. Drives can be mounted in a PC case or used as external devices as shown in the digital curation workstation example below. Because 5.25″ floppy drives are no longer manufactured, we recommend that you purchase a number of back up drives based on your need. We also recommend a disk drive cleaning kit. 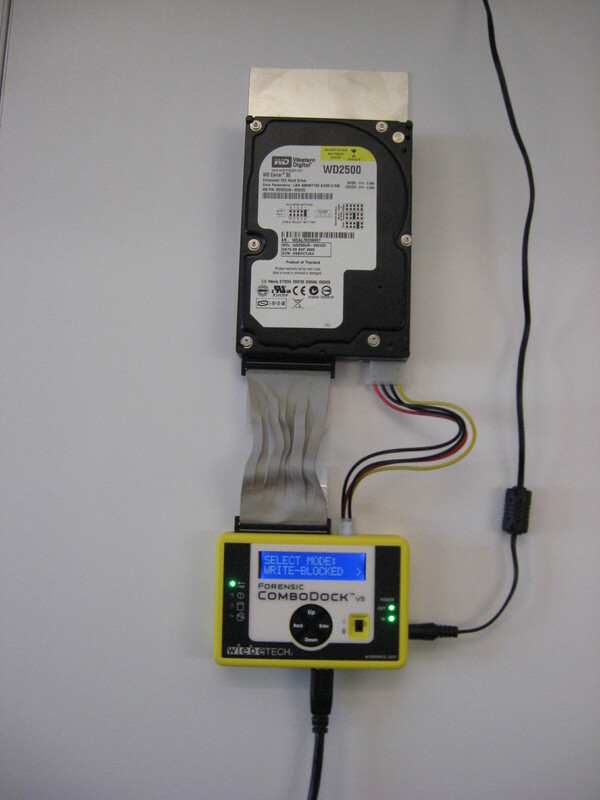 This unit serves as both an interface with IDE and Serial ATA type hard disk drives and as a write protector. Because it is common for the OS to overwrite metadata on a hard drive, write protection ensures that no interactions of the archivist or researcher affects the integrity of the original media. Wiebetech charges $250 for the UltraDock Hardware Write Protector. The BitCurator Environment includes 3rd-party and custom tools for disk imaging, data triage, PII discovery, filesystem analytics and reporting, and metadata export. It incorporates scripted actions that can be run in the GUI against live filesystems for file analysis prior to (or in lieu of) imaging. Additionally, it includes unique software for producing human-readable reports from forensic tool output. Guymager: A GUI-based disk imaging program for capturing disk images in raw, E01, and AFF formats. Bulk Extractor and Bulk Extractor Viewer: A stream-based forensics tool for extracting features of interest from disk images (including but not limited to private and individually identifying information) and associated GUI front-end. Fiwalk: A tool for generating Digital Forensics XML output describing filesystem hierarchies contained on disk images. The Sleuth Kit: Basis Technology’s open source digital forensics framework. BitCurator Reporting Tools: Custom tools developed by the BitCurator team for generating metadata reports useful for archivists and digital-curation practitioners. Sdhash: A “fuzzy hashing” file similarity finding tool. Digital Forensics plug-ins for Ubuntu’s GUI file browser (Nautilus) that can identify file information, generate check sums, read files in hexadecimal format, and perform other file analysis tasks. The half-life of bits: The evolution of Niel Fraistat’s transcription of Shelley’s Prometheus Unbound manuscripts. In 1989, Neil Fraistat worked with the Bodleian Library in Oxford to produce a transcript of Percy Shelley’s Prometheus Unbound manuscripts. These handwritten manuscripts included notations, line-throughs, revisions, line counts and other edits that made them challenging to read. Fraistat transcribed each page using WordPerfect 4.2 and then created a photo ready print of each transcribed page. The subsequent publication included a facsimile of the original page next to Fraistat’s transcribed version, as seen in the image above. 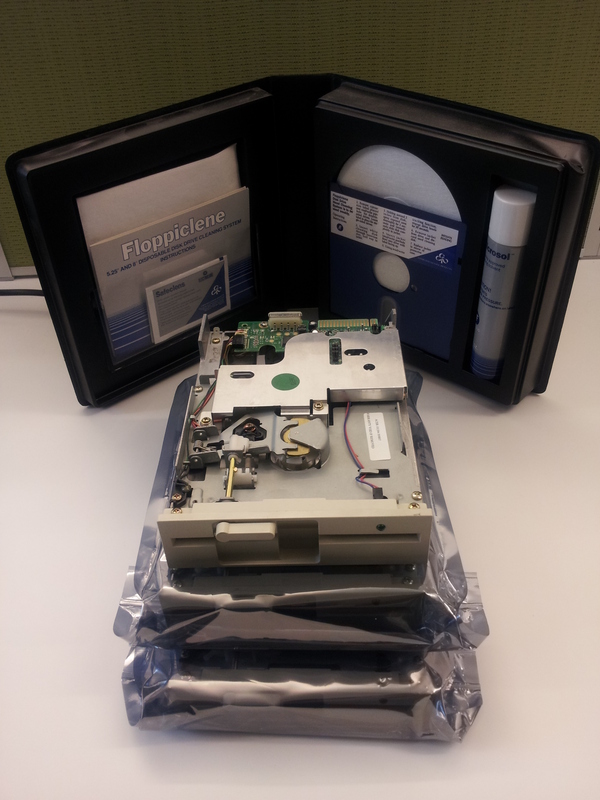 Completed on an IBM PC of the era, Fraistat’s work was saved on 5.25” floppy disks. In 2012, MITH began working on the Shelley-Godwin archive, using Fraistat’s publication of Shelley’s manuscripts as a model for the digital implementation using Shared Canvas. However, the original transcription work–that had also been vetted by the Bodleian–now existed on essentially unreadable media, and in a format no longer supported by contemporary word processors. 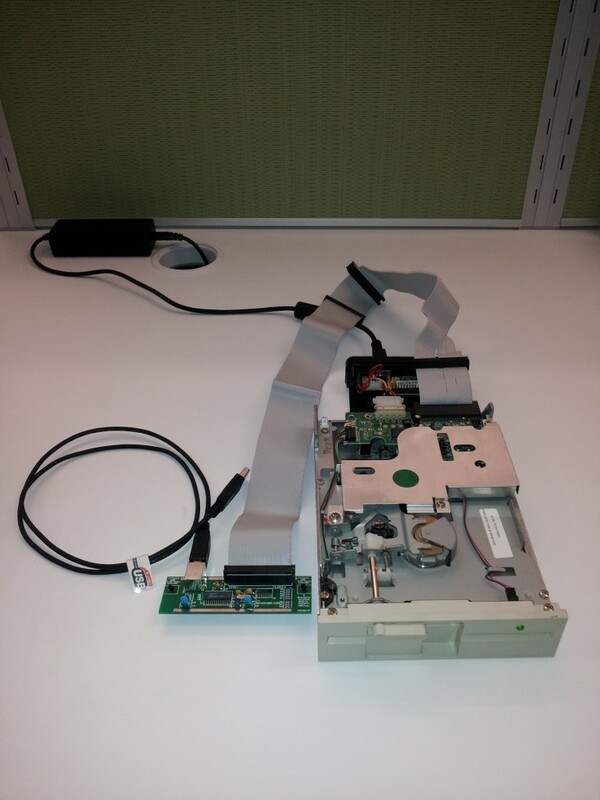 By using the FC5025 seen above and a used 5.25” floppy disk drive, we were able to recover Fraistat’s original transcriptions and preserve Fraistat’s work by creating disk images of the 5.25: floppy disks. We then used Open Office to convert the files to a format readable by a present-day word processor. The now-readable files were then passed to the editors for TEI encoding, saving hours of repeat labor. This case study not only shows the utility of a digital curation workstation, but also asks us to rethink the history of digital humanities. We argue that Fraistat’s early work of thinking through representing analog, handwritten text in a digital medium represents an early form of DH scholarship. At stake in the archival work demonstrated here is not only the preservation of born-digital objects generally, but the ability to examine the history of our own disciplinary practices. It is our argument that for a relatively small investment—roughly a thousand dollars—a digital humanities center can avail itself of the tools required to preserve, archive, and investigate a wide variety of born-digital materials. The hardware interfaces described in this post work in conjunction with the BitCurator Environment’s suite of digital forensics tools to achieve those ends and facilitate the recommendations of the OCLC report cited in the introduction. The Shelley-Godwin Archive case study demonstrates the need for these tools—both hardware and software—in the DH community itself. If Fraistat’s original transcription of the Shelley manuscripts are an early form of DH, as we contend, then we see that what’s at stake here is not simply the concern of archivists and libraries, but the history and legacy of our own practices. The disciplinary sensibilities that inform the digital humanities make the DH center a logical location for these discovery and preservation tools. Further, the capacities afforded by the tools described in this poster will further demonstrate the value of a DH center to host institutions. The BitCurator project is funded through the Andrew W. Mellon Foundation. The principle investigator is Christopher Lee and the co-principle investigator is Matthew Kirschenbaum. Erway, Ricky. “You’ve Got to Walk Before You Can Run: First Steps for Managing Born-Digital Content Received on Physical Media.” OCLC 2013. Reside, Doug. “Digital Archeology: Recovering Your Digital History.” NYPL 2012. Thanks for posting this! I saw the poster at NDSA and found it very helpful, and will be using BitCurator in my class at Pratt SILS. One comments is that you may want to recommend a 750 MB Iomega Zip Drive, which according to the advertisement can read 100 MB, 250 MB, and 750 MB. Thanks, Anthony; glad you found the information helpful. And thanks for the 750 MB Zip Drive recommendations, I’ll definitely look into it. Came across this while looking for something else entirely. But an interesting project, because some of this same equipment is just as valid for retro gaming. – instead of Device Side Data’s FC5025, which seems quite capable, if read only (which is actually good for this application here), instead you might want to consider also KryoFlux, as it seems to do more formats and give more options for extraction, and does have Windows and Linux apps. 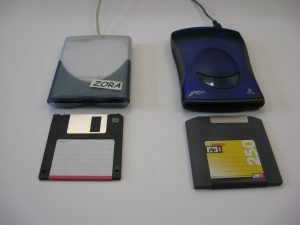 – If switching to KryoFlux, which can handle multiple floppies, should also consider either a combination floppy drive unit or separate 3.5″ and 5.25″ units connected to it. Because what Kryoflux does is not really the same as what a normal 3.5″ floppy drive does, you can keep the USB based floppy drive for more normal access jobs. – Instead of the external USB based Iomega 250, what about the external USB based Iomega 750? it can read the earlier discs (100/250), even if it cannot format/write them, which is also good for this application. – Considering most of these devices are USB based and in the image you have 6 USB based devices you should also consider a full powered USB hub. I admit they do not have the penetration of other devices, but you also have other lesser known removable formats out there, 3″ Floppy, 8″ floppy, Super Disk (LS-120/LS-240). You also have SCSI/MFM/RLL hard drives. Though supporting those old interfaces is a project in itself. Probably easier to assemble a old dedicated system with the interface cards in it than to support on a modern system.